SCOTTSDALE, Ariz. -- On a Major League team full of All-Star power and Gold Glove-worthy defense, Garrett Hampson knows it's going to take some versatility for him to make the Rockies' Opening Day roster. Luckily for him, that's the foundation of his game. Drafted out of high school as a shortstop by the Nationals, Hampson elected to play college ball at Long Beach State. He was drafted again, this time by the Rockies, in the third round in 2016. Almost immediately, his versatility was tested. With the emergence of Trevor Story, it appeared shortstop would be blocked for the long term. So Hampson showcased his flexibility. While still seeing time at shortstop, he started playing second base and the outfield as the Rockies contemplated where he would fit in. Hampson is ranked third among Rockies prospects and fifth among second basemen. He made his big league debut last July and appeared in 24 games for Colorado, where he primarily played second or shortstop and earned a spot on the postseason roster. Now, Hampson's bid to make his first Opening Day roster is coming down to the wire. Less than a week before Opening Day, the Rockies have yet to name a starting second baseman to replace DJ LeMahieu, who signed with the Yankees in the offseason. Hampson, who's seen time in the infield and outfield this spring, is hoping his flexibility has proved he can contribute to a club hoping to again play October baseball. "I wanted to continue to grow at second base and get better," he said. "I grew up playing shortstop mostly, but second base is feeling more comfortable. Learning the outfield as well, I felt like I've taken some big strides and have been feeling more comfortable out there, too." At 5-foot-11 and 190 pounds, Hampson's frame doesn't scream home run hitter. His biggest asset is speed, evident via his seven stolen bases in Cactus League play. However, the 24-year-old has bashed four homers, including a walk-off blast on Friday, while posting a .278/.396/.600 line in 18 games. Add that to his defensive prowess and it's hard to imagine the Reno, Nevada, product not impacting the big league roster at some point this season. "I've performed pretty well," Hampson said of his spring success. "There's a couple things I've wanted to get done. I feel good at the plate right now, good defensively with learning new positions in center and left field. Overall, it's been a good spring." 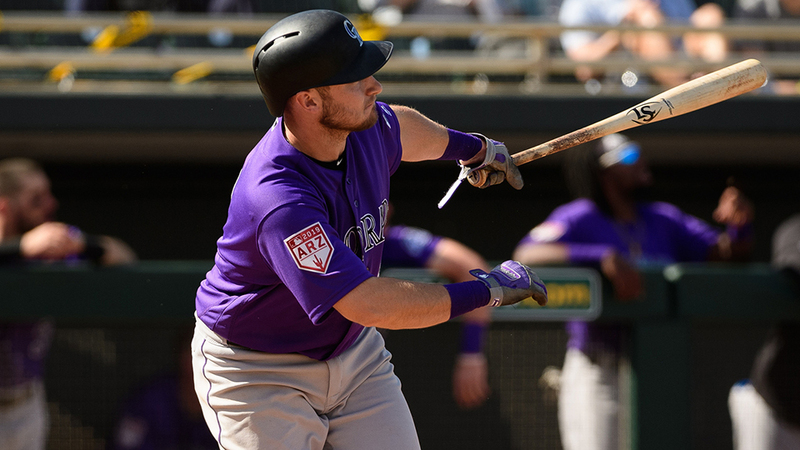 Hampson's biggest competition for the second base job is Ryan McMahon, who's produced a .440/.482/.800 line in 21 Cactus League games after batting .232 with five homers in 91 games for the Rockies last year. It's believed Hampson has the edge for the position, but should McMahon win the job, Hampson may have shown enough to warrant some time as an infield reserve and pinch-hitter. "Him coming up last year, making his debut and being a part of our team for the greater part of the second half, he came in trying to impress us," manager Bud Black said. "[It's] to the point where he wants to prove he should make this team." Has he proved it? Hampson certainly thinks so. "I think I've proven I can be a really good asset to this team," he said. "I can bring some speed, play different positions and contribute in a big way to this club."